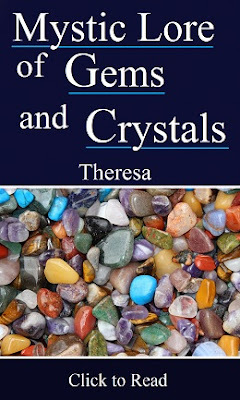 In 2000, the founding-editor of “The Aquarian” was already an experienced student of H.P. Blavatsky. 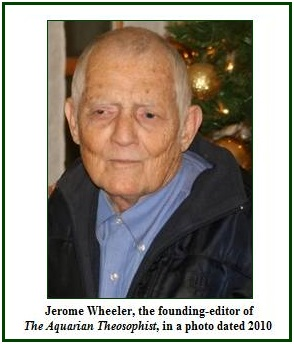 Born in Texas City on August 8th, 1934, Jerome Wheeler had been deeply inspired in his studies by the writings and the life-example of John Garrigues - who in 1909 was one of the founders of the United Lodge of Theosophists. Jerome edited “The Aquarian” for more than five years. Will Windham - a theosophist living in London, UK - took over as its editor in July 2006 and published the magazine for a similar period of time. In February 2012, the Aquarian announced it would start being published by the editors of www.TheosophyOnline.com and its associated websites. “The Aquarian” is committed to the original teachings of modern theosophy. Its goals include making an examination of the struggle between truth and falsehood in the soul of the esoteric movement. The journal also accompanies key world events through its page on Facebook. 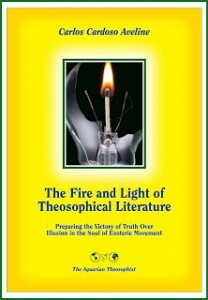 In October 2013 the “Aquarian” published the book “The Fire and Light of Theosophical Literature”. A second book appeared in Portuguese language. It is a translation of “Light on the Path” (“Luz no Caminho”), by M.C., with a 2014 prologue and explanatory footnotes. This critical edition shows the mistakes of M.C. according to the viewpoint stated in writing by Helena Blavatsky. 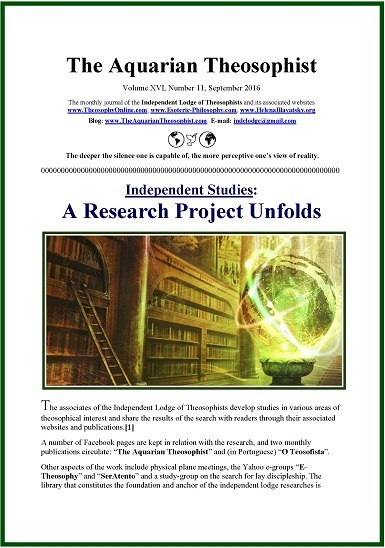 On 14 September 2016, the editors of “The Aquarian” participated in the founding of the Independent Lodge of Theosophists. The Lodge and the “Aquarian” aim at helping the long-term effort for the future of mankind. Ethics is a top priority for them. Their work adopts as main references the Letters from the Mahatmas and the writings of H. P. Blavatsky. See in our websites the article “The Making of ‘The Fire and Light’”, by The Editors of the Aquarian. 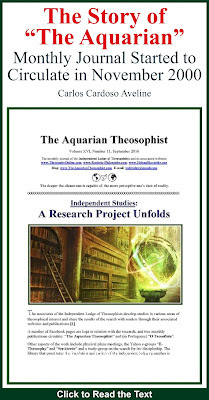 The link to “The Aquarian” blog is www.TheAquarianTheosophist.com. Its complete collection is available at our associated websites. Readers can write to the editors through the e-mail indelodge@gmail.com. A few texts signed by Jerome Wheeler can be found in our associated websites. Among them, “The New Paradigm”; “The Challenge of the Skandhas”; “The H.P.B. Defense Fund - 2005”; “The H.P.B. Defense Fund - 2006”; “The Resurgence of Pseudo-Theosophy”. One text by Jerome has been translated into Portuguese. It’s entitled “O Novo Paradigma”. An initial version of the above article was published in the June 2013 edition of “The Aquarian”.